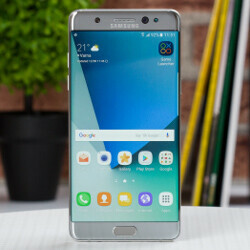 According to a new report, the Galaxy Note 7's battery issue has not only descended the launch of Samsung's flagship phablet into chaos, but has also hit the company's market share to the tune of $7 billion. Though Samsung appears to have identified the issue — a faulty battery pack provided by one of its manufacturing partners — the company is still expected to announce a recall in the immediate future. Numerous reports of Note 7 handsets exploding whilst on charge have cast a black cloud over what initially appeared the perfect roll-out. With 400,000+ units shipped in South Korea, things were going especially smoothly before, well, crashing and burning. A new report from Reuters has pointed out the swift drop in Samsung's MV, and with IFA delivering the usual conveyor belt of devices, this incident could hardly have been more ill-timed. Apple is supposed to show off the iPhone 7 next week and this issue has emerged, so the current state of things do not look good. Only time will tell if Samsung can turn this launch around. But with some prospective buyers likely to swerve an $850 device that may or may not explode if charged, the potential long-term damage this could do to Samsung's PR and consumer trust will no doubt keep bosses awake for the time being. On a lighter note, it appears that only a small portion of Note 7 devices sold — supposedly less than 0.1 percent — have been affected. This should go some way to explaining why, out of nearly half a million sold, only a few have reported a problem. Additionally, it is not believed that launches beyond South Korea will be affected by the devices featuring rogue batteries, despite delays. How the hell does a slow-down of 400,000 Note7 units cause a whopping $7bn drop in market value? Something smells fishy. Lol! Samsung should legit be scared of huawei though. I know this is out of topic but the way note 7 was priced compared to other smartphones is too steep. Really? You're comparing a cheap-tastic phone for $400 from Huawei to the Note 7 with advanced features? You do realize that Huawei phones don't compete with the S and Note. Right? You do realize that Samsung makes low costing phones too. Right? I totally agree with you. To be honest what i am trying ro say is that people around me are less inclined to make a big purchase like the note 7, when you can have a huawei for a cheaper price. Overall you can never compare the amount of work put into both phones. Seriously, samsung needs to work on the software. I'm guessing you haven't seen a Huawei phone lately. What drugs are you on and where can I get them at? With the current world's air pollution just take a deep breath. I think you might be right! Plus, they're also working with Hillary to rig the election! Sure, 400,000 units in a week was really scaring Apple. You watch to much TV young man! no but it is scaring the samsung investor . Apple might have talked to the CEO of Samsung: "dude, we'll give you a brand new iPhone 7 - plus, for you, with 256 GB of memory - if you fk up the Note!" +100000. What u wrote makes alot of sense. Over a battery? You are really saying this over a defective battery? WTF does this have to do with a company Samsung hired to make the battery that is defective? I mean you can read...right? You did understand that the issue isn't the phone, but a defective battery? You do understand that? if so, then WTF does that have to do with engineering? SMDH! Because the press can cause it to drop a few dollars per share. It amazes me how some of the people on here are trying to defend Samsung on every issue. -Lag issue, not samsung's fault -Exploding issues, not samsung's fault -Slower than iPhone 6s, not samsung's fault Of course the share price is dropping. Why? Because it's their fault! You do not know how the stock market works, do you? Psst, he doesn't know what goodwill and public image is. Sure he does. They're the kind of things that you improve by actually acting on an issue, and not blame your users for it. Is the response you would get if you poll people on what a blackberry is. Don't mind the bandwagon riders because no one is talking about their platform of choice. The bumburn runs deep in you. It's evident in your answer, as you're clearly in pain over the facts I mentioned concerning Apple's initial poor handling of the "antenna gate" issue. Only an insecure child would worry about who is talking about their platform of choice. Thanks for admitting that you fit the description. You're the bumburned one. As you can see, I said something about blackberry and you flew in like a wasp out of heck. Get over it. "Only an insecure child would worry about who is talking about their platform of choice." I guess you're pretty insecure then. That would explain why you're so salty all of the time.